At this year’s Awards & Scholarship Banquet, we celebrated some truly remarkable individuals and families. We began the evening by honoring our Executive Team, Board of Trustees, and donors. We also recognized some of the community partnerships we have developed over the past year and their support of our mission. Following dinner, the awards and scholarships were awarded to the recipients. This year, the Creating Hope Award was given to Nate and Leah McMullin for being an exemplary foster and adoptive family. The Wayne Anderson Champion Award was given to Olivia Taylor for her determination and perseverance through many obstacles. The Victor Award was given to Anthony Hussey, who hopes to become a professional plumber and HVAC technician. The William L. Tilton Scholarship was given to Rojuan Holloway so that he can follow his dream of becoming a police detective with the Kalamazoo Police Department. Justin Bouse received the Young Family Foundation Scholarship so that he can achieve his goal of becoming a mechanic. The John S. Vitale Memorial Award was given to Reon Dawson, a University of Michigan School of Social Work student athlete, for his dedication to the field of social work and desire to help others. This year, The Advocacy Award was given to Detroit Police Chief James Craig for his dedication to safety and mental health resources for our youth. This year, we also received an update from last year’s recipient of the William L. Tilton Scholarship, Skylir Kosiorek. 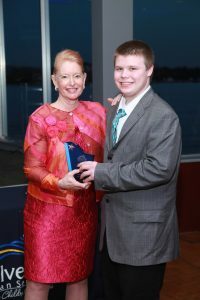 Since receiving his scholarship, Skylir has achieved many accomplishments. He is currently attending Oakland University and studying engineering. He also hopes to earn his Master’s Degree and Ph.D. in Engineering in the future. Skylir recently accepted an engineering internship for the summer. To conclude our evening, we recognized a very special member of the WHS Family, Miss Nevaeh Agler. For one of her fourth grade classes, Nevaeh was asked the question, “If you had $100, what would you do with it?” Nevaeh responded to this question by stating that if she had $100, she would donate it to Wolverine Human Services because of the work that we do for children and families. Nevaeh’s essay was so moving, that Woodhaven Mayor Pat Odette matched her donation to WHS. Because of the generosity and support of people like Nevaeh, the 31st Annual Awards & Scholarship Banquet was a night of honoring and celebrating extraordinary individuals and families who truly demonstrate what it means to be a Victor.